One of the most irritating terms in the current discourse of civic boosterism is “world-class.” It’s a phrase bandied about by many public officials, including the mayor of my city—as if Berkeley (pop. 113,000), should (or could) vie with New York, London and Tokyo. 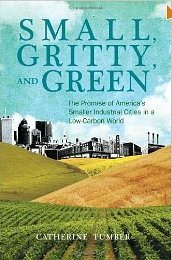 In her 2012 book, Small, Gritty, and Green: The Promise of America’s Smaller Industrial Cities in a Low-Carbon World, historian and journalist Catherine Tumber presents a welcome corrective to “the cult of giantism”: environmentally grounded “civic modesty.” Her argument is doubly provocative, drawing its examples of sustainable, smaller-scale urbanism from places long since written off by cosmopolitan sophisticates: midsize industrial cities of the Rust Belt. By “midsize” or “smaller,” Tumber means cities “that at their peak in, generally, 1950, had populations of roughly 50,000 to 500,000 souls, and whose numbers today have dropped (though not universally) by at least 20 percent.” She has a firsthand acquaintance with such places, having grown up in a farming village outside Syracuse and spent most of her life in Syracuse and Rochester, as well as Albany and Detroit. Tumber, however, is not on a nostalgia trip. Quite the contrary: Small, Gritty, and Green marks the devastation inflicted on smaller industrial cities by urban renewal, the national highway system and the suburbanization it spawned; deinustrialization, outsourcing and globalization: ravaged local economies; massive job loss and impoverishment; white middle-class flight; boarded-up downtowns; abandoned neighborhoods; deteriorating infrastructure; townscapes mutiliated by hulking freeway interchanges; food deserts whose expanse is hard for many Bay Area residents to imagine (in 2010 the entire city of Flint, pop. 102, 434, had no grocery stores). What leads Tumber to view “flyover country” as a potential site of pathbreaking, environmentally oriented urbanism is her conviction that despite their travails, smaller industrial cities possess unique qualities that could enable them to play a central role in kicking our dependence on fossil fuels. “[E]ven in their diminished state,” she writes, “they have significant population density, and capacity for more”—a crucial requirement for the support of transit alternatives to the private automobile, not to mention, the critical mass of diverse interests and activities that are the fount of city life. Unlike dense metropolises, they also have a lot of vacant land, thanks to their economic and demographic shrinkage. “In the Northeast and particularly in the Midwest, that land is among the richest in the world” and hence prime venue for a relocalized, urban agriculture. And smaller industrial cities have substantial manufacturing infrastructure and workforce skills that could be the basis of a decentralized, productive green economy built on renewable technologies. To discover if and how midsize industrial towns are exploiting their distinctive assets, starting in fall 2008, Tumber visited 25 of them, including the larger ones of Detroit, Cleveland, Buffalo and Milwaukee, and spoke to a wide range of people: city and regional planners, mayors and city managers, academic sustainability experts, developers, entrepreneurs, farmers, market organizers and unsung “paid community organizers, community activists, newspaper editors and writers, bloggers and the occasional unclassifiable iconoclast.” Much of Small, Green, and Gritty reads like a richly detailed, investigative travelogue. There are heartening success stories, such as Rochester’s 2008 decision to to reduce fares on its bus system from $1.25 to $1.00—a move that boosted ridership by 2 million and enabled the city to buy fifty new eco-friendly buses while remaining debt-free. In Holyoke, Massachusetts, a former paper mill city whose population is now 41 percent Hispanic, mostly of Puerto Rican descent, Nuestra Raíces has created eleven community gardens worked by 140 families and built a 30-acre farm, La Finca, two miles from downtown. Muncie, Indiana, is capitalizing on its windy weather, its long history in the transmission and gear business and Ball State University’s programs in manufacturing engineering and mathematics, to foster a renewable energy business cluster focused on wind power. But Tumber also emphasizes the enormous challenges facing these communities as they strive to reinvent themselves. Straitened circumstances aside, some of the difficulties spring from internal divisions. One of many examples: Detroit, another city without a single supermarket and a lot of vacant land, has become the poster child for the new urban agriculture. In 2009, “more than 900 community and small-plot gardens, and a handful of 2- to 10-acre farms were under rcultivation…, providing about 120 tons of food, or 10 to 15 percent of the city’s food supply.” But the city’s agrarian scene is deeply conflicted over race (should Detroit’s food security movement be led by African-Americans? ), regulation and scale (should large-scale, commercial agriculture be allowed on abandoned land, especially in the absence of an agricultural ordinance?). Midsize cities are also dismissed by cultural cosmopolitans, a contemptuous gesture that Tumber traces back to the early twentieth century: think H.L. Mencken. Without question, however, the writer whose aspersions have had the most lasting and damaging effects on smaller-scale urbanism is Jane Jacobs. In a book filled with fresh ideas, Tumber’s contention that Jacobs’ metropolitan bias, set forth in her masterwork, The Death and Life of Great American Cities, was badly misguided, stands out. So does her admiring tribute to Lewis Mumford. Fallen out of fashion, partly due to his public disagreements with Jacobs, Mumford appears in Small, Gritty, and Green as a profound and prophetic critic of “metropolitan monopoly.” Tumber includes him, along with Wisconsin Governor Robert “Fighting Bob” M. La Follette, Sr., Louis Brandeis and C. Wright Mills in her short list of America’s “antimonopoly progressive populis[ts]” who worked in the Jeffersonian tradition of decentralized power—a home-grown line of thought that, she says, could serve the contemporary U.S. localization movement. And though she doesn’t locate Jacobs in that tradition, Tumber calls Jacobs’ later studies—The Wealth of Cities and Cities and the Wealth of Nations—“the best starting point for understanding localist economics” and objects to the selective appropriation of Jacobs’ notions of entrepreuenurial improvisation and collaboration by Edward Glaeser and Richard Florida and other celebrants of the “new economy,” “knowledge” workers and the creative class. My one reservation with Smart, Gritty, and Green has to do with its commendation of smart growth and its close cousin, the new urbanism. Tumber prefaces her discussion of “agriculture on the urban fringe and beyond” (as opposed to farming in the urban core) with a portrait of new urbanist co-founder Andrés Duany and a description of his colleagues’ attention to the ecological particularities of different places, their fight against suburban sprawl and their advocacy of walkable, mixed-use neighborhoods. As a longtime local land use activist, I’m familiar with these ideas—the Bay Area is a hotbed of new urbanism and smart growth—and when I chaired the Berkeley Planning Commission, I voted to put dense, transit-oriented development in Berkeley’s new general plan. That said, in my experience these ideas often look a lot better on paper than in reality, and sometimes they look bad even on paper (Google “Saltworks Plan”). I’ve yet to hear a smart growther or new urbanist look at a proposed infill project and say that it’s too big. Advocates of both movements disdain urban manufacturing, viewing industrial lands as “opportunity sites” for housing and commercial uses, thereby exacerbating both sprawl and global warming, as well as gentrification, by pushing industry to the outer edges of urban settlement. Worse yet, they simply write off their critics as NIMBYs. Tumber herself notes that “conservation subdivisions”—new developments that integrate high-density residences with agriculture, usually built on greenfields—have been criticized for extending sprawl, not reducing it. All of this comports poorly with Tumber’s ideal of democratic, environmentally solicitous, smaller-scale urbanism, an enlivening vision that can stand on its own strengths.